This pie is unusual by modern standards, but I have seen similar recipes in several 19th century cook books. 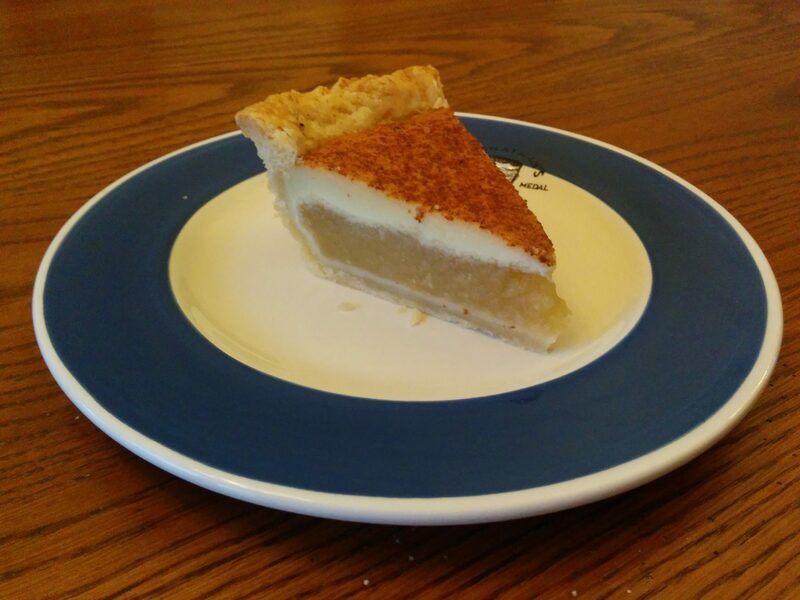 It’s essentially an applesauce pie topped with custard. I first made this pie because it just intrigued me, and it sounded pretty good. After the first one, my only question is “why did this stop being common?” I’ve made several since then. Yes the apple part is just plain applesauce, though reduced a little to thicken it. And yeah, if I was in a hurry, no question I’d just throw 3-4 cups of applesauce in a saucepan instead of cooking down apples. After that, it’s just a dead-standard custard poured over the top, then bake it. But the simplicity of the ingredients distracts from the genius of it. 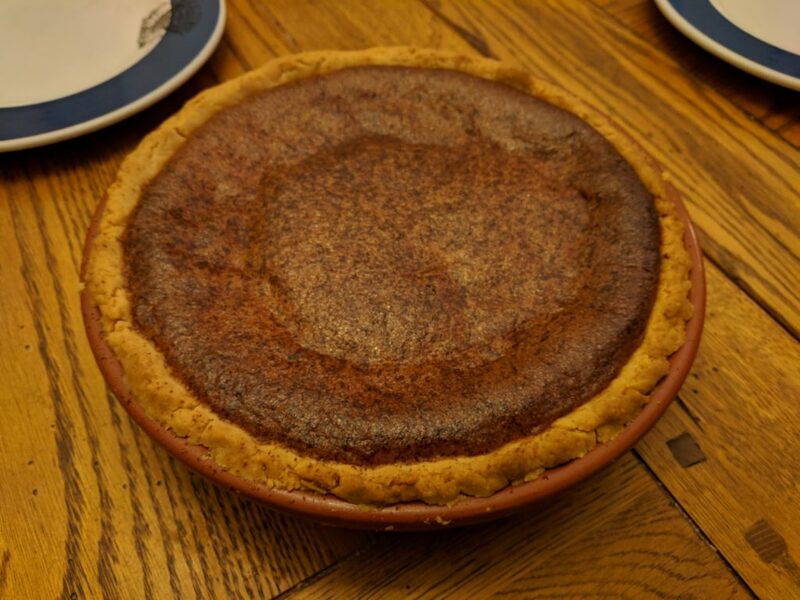 It’s a very tasty pie, and it has lots of potential for modification. Want to spice up the apples? Sure, why not? Maybe some lemon peel grated in it? OK. Some raisins soaked in rum? … uh, gotta go, I think I need to make another pie. 8-9" Pie pan, lined with unbaked pie crust. Add the apples to a pot, with a couple tablespoons of water, depending on how firm the apples are. If the apples are not particularly tart, you may use lemon juice in place of the water. Place covered pot over medium heat until it starts to boil, stirring occasionally. Remove lid when the apples just start to soften. Continue cooking and stirring until the apples are soft, and somewhat thick. Push the apples through a sieve/mesh strainer. Alternatively, you may use a food mill, or food processor. Beat the eggs in a bowl, then while beating, add the sugar and then the butter. The butter should be liquid, but not hot. Beat until the sugar is dissolved. Take your lined pie pan, and brush some of the egg mixture on the bottom and sides of the crust. This will help prevent it from getting soggy. Pour the apple mixture into the crust, and spread very smoothly and evenly. Try to get the top as level as possible. Pour the egg mixture over the top, then grate the nutmeg over the top of the custard, to your taste. Place the pie in the oven, and bake 40-45 minutes, until the custard is set, and starting to brown. Remove from the oven, and let fully cool to room temperature before serving. The more thinly you slice the apples, the faster they will cook down. The less time on the heat, the "brighter" the flavor. I sliced them about 1/8" thick. The softer the apples, the less water you will need to add. The water is mostly for steam, to get the apples hot enough to release their own juices. Hard apples will take longer, so more water. Four tablespoons should be the maximum for hard apples like Granny Smith. I have used rose water when cooking the apples down. This is definitely a personal preference. I like it, many do not. It's definitely an "old time" thing. You could spice the apples when cooking them. Cinnamon and cloves are an obvious choice. I would add them when the apples start to soften. If you are slicing thin and cooking the minimum, I would not spice much, if at all. If the apples are very soft, or you will be cooking them down for a longer time, I would definitely consider adding some spice. Think of the difference between apple sauce and apple butter. I honestly would not add sugar to the apples. Even with using 100% Granny Smith apples, I found it to be very good without. You want the apple mixture pretty thick when you are done cooking them. It makes them more difficult to sieve if you are doing it by hand, but they need to be thick enough to hold together for the pie. I could be very tempted to try this with a jar of apple butter... And, of course, if you want to "cheat", you could just use a jar of applesauce, though I would still recommend heating it, and possibly boiling off some liquid. If you use this method, approximately 2 cups for a standard pie dish, and 2-1/2 cups for a deep pie dish, after boiling down. The 8" pie pan I used was a little deeper than "standard." If your pie pan is shallow, you may need to reduce the apples a little, or use a 9" pan. I would not reduce the amount of custard. M. W. Ellsworth and F. B. Dickerson, The Successful Housekeeper. Harrisburg, PA: Pennsylvania Publishing Co, 1887.